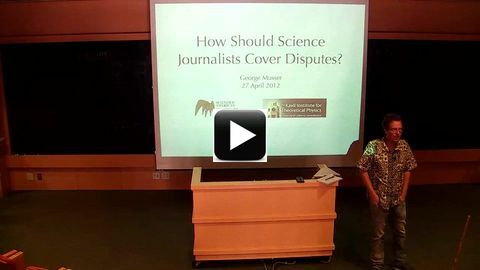 George Musser, Scientific American & KITP, Discussion: How Should Science Journalists Cover Disputes? One of the trickiest issues in science journalism is how to make sense of scientific disagreements. A notorious problem is false balance: equal time for undeserving claims on questions such as climate change and the autism-vaccine connection. General-interest media such as newspapers and TV news are especially prone to this syndrome, but even more specialized media such as Scientific American struggle with how to weigh competing claims. I'll offer some remarks and then open it up for general discussion. I'm interested in your thoughts and advice for how we journalists might do better.